"Explosive, dangerous and Fast Paced!" After reading a few pages, I was hooked, (a true page turner). Taylor Wilson was very happy being married to Phil Wilson, who disapears after their home is destroyed. Taylor find herself on the run in protective custody with and FBI agent Mark Cochran, whom she does not like. Someone is trying to kill her, but she knows not where her husband has gone. To many lies and secrets fill her days and long nights. Agent Mark Cochran thinks her husband is guilty of something that has caused this uproar in her life, but she believes her husband is innocent of any bad deeds. People are being killed all around her, but she stands firm that her husband has done nothing wrong. She receives strange messages from her husband, but she cannot figure them out. She finds herself doubting him at times. As she and Agent Cochran run as fast as they can to keep her alive, she becomes closer to Cochran, but she wants to find her husband, for there are so many lies, so many questions she must ask him....will she run out of time? 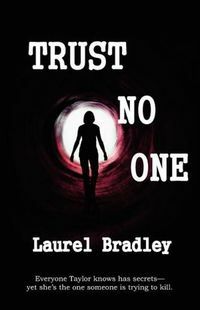 Read this great suspense, thriller, and find out!!! A big WOW for TRUST NO ONE! Taylor Wilson�s husband, Phil, has them. His best friend and art agent, Sean, has them. Everyone has them except Taylor�yet she�s the one someone is trying to kill. Moments before a bomb destroys Taylor�s home, Phil disappears. Soon after, her landscape design business blows up as well. FBI agent Mark Cochran puts her into protective custody, but whoever is behind the bombings continues to stalk her. Cochran thinks Taylor�s husband is the culprit, but she refuses to accept it. She believes the cryptic messages Phil is sending her are proof he�s trying to protect her and lead her to where he is hiding. However, while searching for Phil, Taylor learns he may not be as innocent as she believed. Will Taylor�s faith in the man she loves keep her safe�or get her killed?